Loren Renner has spent more than forty years fishing Lake Texoma. He was a well-known fishing guide and he knew a thing or two about catching the famous Striper Bass. So thirty years or so ago he came up with his own brand of artificial bait and began selling his Loren’s Lures. One of the most popular lures is the Sassy Shad chartreuse glitter style. Working and selling our of their tackle shop-hobby shop factory in Whitesboro, Chad and Michele Rigsby carry the mantle for Renner, and still make a 100 percent Made In America product, only now the world comes to their doorstep via the Internet to buy a better fish-getter. “The Sassy Shad has always been popular for many fish. We hand make these lures in many colors with 3-to5-inch bodies made with durable American made resins that create great ‘tail action,” says Rigsby. Loren’s original handmade lead molds are still used to reproduce the proven shape he perfected. 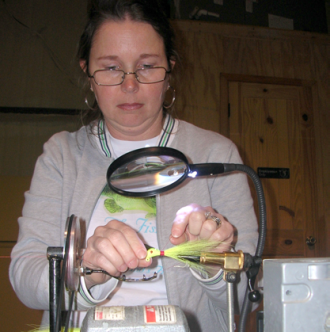 Loren's Lures are still made by hand with parts made in the U.S.A. I enjoyed reading this article, and I was looking at Sherman, Texas, and wanted to see something on the Denison Dam and Lake Texoma. I was recently going through some old papers, and came across my greatgrandmother’s obituary (Annie Shannon McHenry), and read that her parents were principal landowners in Grayson County, owning land at the site of the present Denison Dam and Lake Texoma. Members of her family named the city of Sherman…..so that is going back a ways.